-located 10 minutes from the old town! -completely renovated interior! -fully equipped kitchen! -breakfast and linen included in price! -24 hour check in ! 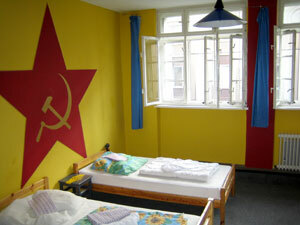 This is a small hostel located in the heart of Kazimierz, the old Jewish district of Krakow. Modern Kazimierz is the centre of Krakow's culture - many pubs and bars make it a unique place that everybody should visit. Because we have a chain of hostels we know exactly what our guests need and have spent time perfecting each place for your comfort. Our hostel's name 'Home Made' reflects one of our main principles, the re-use of classic furniture and equipment that used to be part of authentic Hungarian homes. If you come to stay at our hostel, you will find redesigned objects with a different function that may surprise the traveller. Our guests sleep in individually designed beds and lofts, sit and lie on nicely and creatively renovated old furniture, read books by hand-made lamps or use sold suitcases as shelves. The traveller can feel the warm, peaceful, cosy and the friendly atmosphere of a home at the hostel. Our friendly property is located between the aiport and the city next to the metro station, so all parts of Budapest are easily accessible from the hostel. We offer small dorm rooms and private rooms, all with own bathroom for a reasonable price, that includes a buffet breakfast as well. Our friendly staff is at your service 24 hours a day at the reception and the bar. We work so that we can make your stay enjoable in Budapest! The Riga House Hostel invites you to be our guest while you discover Riga. As an Independent Riga Hostel run by travellers for travellers, we pride ourselves on not just being a Riga backpackers Hostel, But rather being a Riga backpackers home. Budget hostel in the center of Interlaken, just 5 minutes walking distance from the Interlaken West train station. We are your best starting point for adventure and sports in both summer and winter. Our bar and restaurant "Brasserie 17" is the #1 spot for food and fun."